Thera Cane Review: Does this Therapy Cane Massager Really Work? Dealing with chronic pain is certainly no joke. It is also big business, however. With millions of pain sufferers in this country, the sheer amount of noise in the healthy living sphere can be a little overwhelming. With thousands of products and services all clamouring for your business, it is very important to cut through such noise. In that vein, the following will offer a balanced and detailed look at a pain-management product called the Thera Cane. If you’ve never heard of this, it is an odd and deceptively simple looking self-massaging tool that nonetheless claims — and is backed up by thousands of evidently happy customers — to be effective in helping you remove muscle knots or painful trigger spots anywhere on your body. Many people have things they just can’t help buying. For the camera lover it’s bits of camera equipment like lenses and tripods, for the DIY lover its equipment for the toolbox, but for me, it’s searching for and looking for the best myofascial release tools. I’d heard about the Thera Cane many times before and finally decided it was time to get one for myself. The following will present an overview of the Thera Cane, how it works, who it may work best for, and how it compares to other options. I’ll also throw in my own experience with using one for the first time. 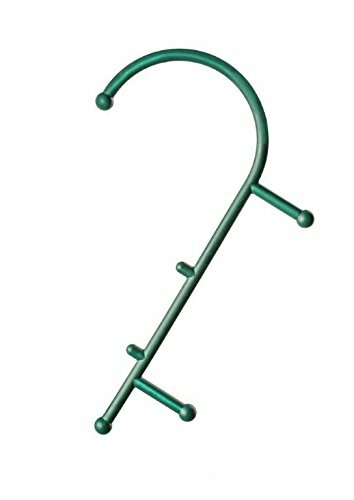 The Thera Cane is a cane-shaped plastic tool, measuring 25 x 15 x 1 and weighing about a pound, that has six pressure knobs that are designed to reach and massage any sore spot or muscle knot you may have. If you are new to the whole idea of myofascial release, we’ll look at it in more detail in the next section. The Thera Cane claims to work by achieving something called “myofascial release“. Myofascial refers to the tough, thin and fibrous tissue that surrounds, protects and connects your muscles, bones, nerves and joints. The “release” part of the term refers to exactly what happens during conventional massage therapy. While certainly not free-of-charge, massage therapists commonly work wonders on people’s muscles by kneading and twisting knots of tense muscles into relaxation. Myofascial release relieves pain of all kinds, even migraines and something called referred pain. This is when pain in one problem area can be the source of pain in another area. Further, it can also improve your blood and lymphatic circulation, can be a crucial treatment for those with limited mobility, and of course, can make you feel wonderfully limber and relaxed. The health benefits of myofascial release are clear. Simply put, this type of therapy — which is the core functionality that the Thera Cane claims to provide — gets impressive results that are long-lasting. The advantage of the Thera Cane, so the creators claim, is that all these wonderful results can be gained without a massage therapist, all you need is the Thera Cane. How does the Thera Cane work? Explaining how the Thera Cane works is not overly easy as there are so many ways to use it. The idea is that you would manoeuvre the Thera Cane in such a way in which you dig the knobs into your muscles and gently massage them. The beauty of the Thera Cane is that it can also reach the most hidden places such as the back. To get a better idea of how the Thera Cane works, watch the short video below. One of the big advantages behind the Thera Cane is that you can use it in whatever way it suits you. You can use the knobs that stick out to push into tight muscles and use the hook to reach areas in your back that are usually inaccessible. The owners manual has listed out other ways you can use the Thera Cane. Here is a summary of some of the pros and cons of the Thera Cane. When you get your hands on the Thera Cane for the first time you can tell it is very well made. The material feels strong, durable and the finish is very smooth. The Thera Cane isn’t just a piece of cheap plastic. The Thera Cane is also very comfortable to hold and use. How Did the Thera Cane Work for Me? After a week or so of using the Thera Cane, I had pretty much worked out how it worked best for me and how it rated compared to other myofascial release tools. I like the Thera Cane but it didn’t give me as great a level of satisfaction as I would have liked. There are some tools that you buy for the first time that immediately hits a newly discovered trigger point. I didn’t get this from the Thera Cane. Perhaps it’s unfair on the Thera Cane due to the fact that I’ve tried other tools which have already released most of the obvious trigger points on my body. It could also be that I don’t have any real troublesome trigger points on my back. That being said, I found the Thera Cane did work well for whatever little tender spots I did have on my back especially down on my lower back and on my quadratus lumborum. It’s also great for hitting the back of the neck muscles and gently poking at the other muscles around the side of the neck. Hitting these areas can be done with your own hand but I have started to use the Thera Cane whenever I am sitting down or watching TV. It’s perfect to put by the side of your TV chair and pick it up to get some quick release or dig around for any small trigger points on the back. In this respect, it works very well. On the other hand, I found all the other knobs on the Thera Cane pretty much redundant. There are knobs on the handles which you can dig into other areas such as your chest, pecs, thighs and other fleshy parts, but these didn’t work that well for me. I would much prefer to use other specialised myofascial release tools. I wouldn’t use it on my legs as I’d rather much use a massage ball. This is the same if I wanted to roll out my back. I’d prefer to grab a hard massage ball and press my back against it whilst it’s on the ball. For me, nothing beats this method of massaging the upper traps and back area. I find that by using my own weight I get a far greater release. The other problem I had with the Thera Cane is that the rounded nature of the knob meant it often slipped off the areas I was trying to massage. Furthermore, for some areas of my back the rounded shape of the Thera Cane didn’t work that well as it didn’t dig in with as much penetration as I’d like. I do think the Thera Cane is still a great tool despite the fact that I still prefer other myofascial release tools ahead of it. I’m still relatively mobile so I am able to get on the floor and roll my back and body with intensity, however, someone who needs only a delicate massage and doesn’t want to get on the floor or apply too much pressure will find the Thera Cane a better option. I believe the Thera Cane is more suited to someone who is in chronic pain or has severe mobility issues because otherwise using a massage ball on the floor or against a wall will prove to be more effective for most people. In addition, someone who has been in physical therapy will benefit from using the Thera Cane also. I also feel that people who are looking for a tool that provides a general relaxing massage will not find the Thera Cane to be the tool for this type of massage. The Thera Cane works best for locating tender spots and releasing them, rather than being a tool that relaxes you after a hard day. It should be noted, though, that the six relaxation knobs on the Thera Cane are quite hard and it can be easy to apply too much pressure on problem areas. There is definitely a bit of a learning curve when first using this product. It is advisable when first using this or similar products to ease into them and not expect to cure all of your aches and pains overnight. After using it for the first time, many will likely feel quite sore for the next couple of days. This is normal. Just be aware that too much pressure applied for too much time, can be potentially harmful. Yes. Despite other tools being more effective for me, I would buy it again. As I wrote earlier, I have become accustomed to using it whilst watching TV. Sometimes, I’ll just grab it whilst standing up to massage my neck or poke around my upper trap area. I do prefer using massage balls for these areas but if I am feeling lazy I’ll grab the Thera Cane. In addition, I use the Thera Cane in helping to release tiny tender spots on my back and it has proven to be very effective in this particular area. I would also buy the Thera Cane again as opposed to a cheaper alternative. The Thera Cane is very sturdy and durable, and I can envision that there would be a lot of problems if the knobs weren’t as smooth as they are on the Thera Cane, as you could cut yourself as you brush it across your skin. I want to point out that I am not someone with chronic pain or in physical therapy. I do feel that had I been, this review would have been dramatically more positive and the Thera Cane would have provided a lot of relief. Overall, the Thera Cane does appear to be quite effective at delivering on its claims. If you are someone with chronic muscle or joint pain, this odd looking device might be a very good option. The same could also be said for those that spend any length of time on a fitness regimen, especially strength training. Such a tool as this can help muscles heal while at the same time relieve post-workout soreness. Besides relieving pain, the Thera Cane can replace professional massage therapy if that is not a priority or is unavailable. A positive aspect of the Thera Cane and similar tools is that you can use it on your own, even if you have a limited range of motion or mobility. Probably the biggest selling point of the Thera Cane is that it can potentially replace other, more expensive treatments and instead place a measure of therapeutic healing power in your own hands. Is the Thera Cane the Best Massage Stick Available? If you’ve done any kind of search on the Thera Cane you’ll have come across a lot of alternative products that seem similar to the Thera Cane if not identical. Since this product hit the market and sold well, several Chinese-made counterfeits appeared. Personally, I didn’t want a replica, I wanted to try the real thing so I made sure I bought the real Thera Cane. I have no idea how the cheaper canes compare but I can’t imagine that they would be as sturdy or durable as the real thing. It’s fairly easy to make sure you buy the real one as Thera Cane are registered as sellers on Amazon, so if you make sure you buy from them, you shouldn’t have any problems. Also available on Amazon are several products that are very similar to the Thera Cane. A particularly popular alternative is the Body Back Buddy. Both the Body Back Buddy and the Thera Cane are considered the two best massage sticks on the market and are in a constant battle to be named the number one myofascial release tool. After around 6 months of owning the Thera Cane, I also decided to try the Body Back Buddy as well. If you’ve pretty much decided you want a Thera Cane you may want to hold on a little longer and read my the Body Back Buddy review first before making a decision. If you want to see even more options, see our post on the best trigger point massage sticks.